The Separation of Powers vs.
Tyrants fear nothing more than a mature and healthy Judeo-Christian community. There will never be a secure free market of ideas so long as there is no free enterprise education. To keep that free market of ideas, we must keep government out of education. And the only way to keep government limited to its rightful role as referee is to have a people who themselves are strengthened with a sturdy independence under the law and grace of God — and who can thus hold civil government accountable. In 1962, the Supreme Court handed down a decision (Engel v. Vitale) that prayer in public schools was in violation of the American Constitution. Their decision had then, and still has, no basis in history or in constitutional law. This was the first decision the Court ever made with not a single precedent cited. That is because there were none to cite. It was a decision flying not only in the face of our documented legal (Supreme Court) history and Constitution but also in the face of any reasonable education system. And, more important, the real problem was not prayer (talking with God) in schools, but government (coercive force) in schools. Thomas Jefferson (who did not help write the Constitution because he was ambassador in France at the time) first used the phrase “wall between Church and State” in an obscure letter in 1802, fifteen years after the writing of the Constitution. 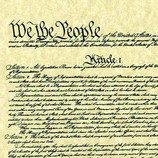 Every single Supreme Court decision relating to Church/State relations right up to the 1940s affirmed, or was compatible with the belief that America historically had always been, and logically could only be, a Christian nation based on Biblical principles, and that the American understanding of political freedom emerged from and was built on those Biblical principles. – Divorce rates, declining for 15 years, in 1962 began a 17 year climb to 3 times their pre-1962 level. – Birth rates for unwed girls ages 15-19, climbed 24 straight years to over double pre-1962 levels. – Pregnancies to unwed girls under 15 years went up for 12 straight years increasing five times. – Violent crime skyrocketed for 28 straight years to six times previous rates. – Sexually transmitted diseases, which had been dropping, climbed for 12 straight years to over 3 times pre-1962 levels (and AIDS was yet to come). – National productivity which had increased nearly 2% yearly, has dropped since 1962 to average just over 1/2% yearly increase. America has fallen from being the world’s largest creditor nation to being the world’s largest debtor nation. – SAT scores, holding level since 1941, began in 1962 an 18 year drop, and have not recovered. In one year, 700,000 high school students graduated who could not read their own diploma. A 1983 government report, A NATION AT RISK, reported that to be the first generation of American children who will not receive an education surpassing their parents. During the 1990’s, America, which had had the best education system in the world, sank to the bottom of educational test results of all the major economically competing countries. Education has focused on affective and behavioral areas in order to producepolitically acceptable citizens. It has all but abandoned proper teaching of reading, writing, and arithmetic. In the early 1990s, Americans saw banner headlines telling us that 92,000,000 of us (half of the adult population) were functionally illiterate. Boston, in the early 1800s had a literacy rate well over 90%. Reasonable education aims to set a student free to make practical and moral decisions according to his educated conscience, not to prepare for conformity to a social image constructed by unelected and inaccessible social engineers and bureaucrats. It is unreasonable and intellectually indefensible to pretend that our religious heritage is unimportant or should not be studied in school. It is a failure of professional competence and a violation of basic democratic procedure for educators to propose an educational system in which the religious arena (formation of conscience and values) is by law taken over from the churches, synagogues, and families by a mandatory, secular school system. Such an education is the final takeover by governmental coercive force of the religious arena which is guaranteed a separate and free status by our constitution. Any reasonable education must therefore equip students to deal with the “religious arena”, that open place of discussion where the great moral and religious issues of life are debated. Reasonable education therefore requires — not that morality and religion be stricken from school curricula — but that the religious and moral traditions of our people be fully discussed, honored, and accurately taught in our schools. All comprehensive education is religious by nature. Government education, like everything government does, is done at gunpoint. 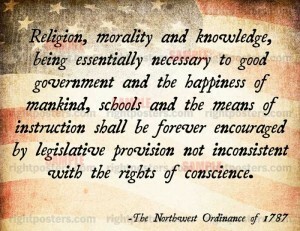 Government education will therefore enforce, at gunpoint, some religion. The problem, therefore, is not religion or prayer in schools, the problem is civil government in schools. The most important systemic change for good that America could make would be to remove all government influence from education, and to return it fully back to the parents, and to those agencies to whom they choose to entrust their children. Control follows money. When government takes money away from people through taxation (i.e., at gun point), and then turns around and offers to “help” with that same money, which they now “own”, government will be in charge. The only way parents will be the primary authorities over their children’s education is when either they foot the bill, or they freely choose the source of financial help. A legitimate pluralism is one in which all views have equal opportunity to develop and express themselves in public debate. Only a free market system is capable of promoting a legitimately “pluralistic” society. A free-market education system is also necessary to limit government control by run-away bureaucracy and regulatory law, both primary tools of wrongful control of the people. Common Core isn’t wrong because of the values it teaches.Common Core is wrong because it is an unconstitutional, federal usurpation of power. In fact, it’s not even directly from the federal government, but a private initiative from the Gates Foundation used by the federal government to coerce states. It is the very same “gun to the head” of the states that Chief Justice Roberts referred to in National Federation Of Independent Business v. Sebelius (Obamacare) with regard to the medicaid expansion coercion. Regardless, conservatives, libertarians, and moderates are all too in favor of such usurpation when it aligns with our values. This is not only wrong, it is extremely dangerous.